Without the efforts of a few passionate individuals in the reinsurance industry, St. Baldrick’s may never have gotten off the ground. 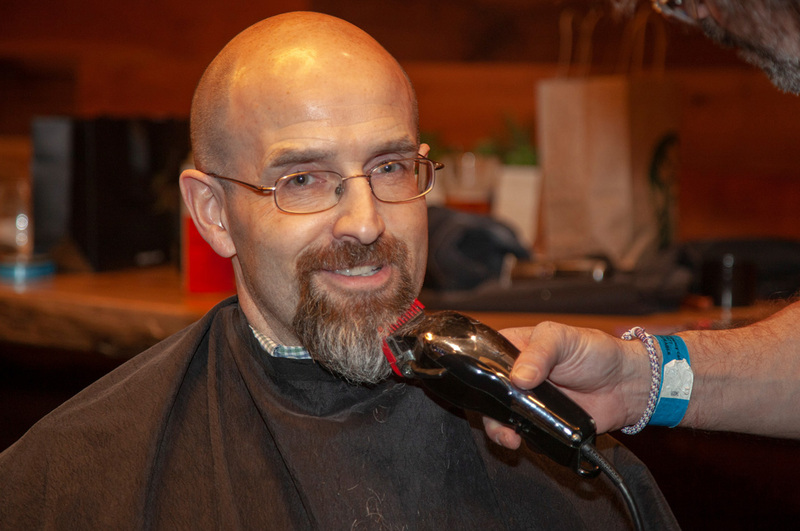 And Rich Manz knows this first-hand – he watched head-shaving take off in his industry and, as a director of Gen Re’s Corporate Donations program, he’s played an important role in getting his colleagues to rally around raising funds for childhood cancer research. Rich’s passion for the cause took root when he visited the pediatric oncology unit at the Yale School of Medicine. “I saw how different treatment was for children with cancer … it struck me how much of their childhood is taken from them,” Rich said. After Rich learned about the St. Baldrick’s event at Jim Brady’s in Manhattan, he decided he wanted to do something similar for Gen Re in Stamford, CT.
Today, Rich is a 10-time volunteer event organizer, making him one of St. Baldrick’s most prolific event organizers. After hosting a Gen Re event for several years at his company, he joined forces with other reinsurance professionals and began captaining the Team Gen Re “Rock the Bald” at Bobby V’s Restaurant & Sports Bar in Stamford. Rich said he’s encouraged by the consistent support of his company, Gen Re. “It’s comforting to know that it’s not always all about the bottom line and that my fellow associates can rally around a great cause,” Rich said. If you’d like to get your company involved with St. Baldrick’s, reach out to us by email or call 626.792.8247 ext. 248. Remember, many companies also have a matching gifts program where your donations can be matched dollar for dollar. Join Rich in the fight against childhood cancers. Keep in mind that you can do this in any capacity you choose.